About 3 years ago, on a trip to Ecuador to visit The Galapagos Islands, I made a stop at a place called Ipiales – just north of the Ecuadorian border with Colombia. I had been told of a stunning church that crossed a river valley and was back-dropped by a waterfall. How could I miss that? 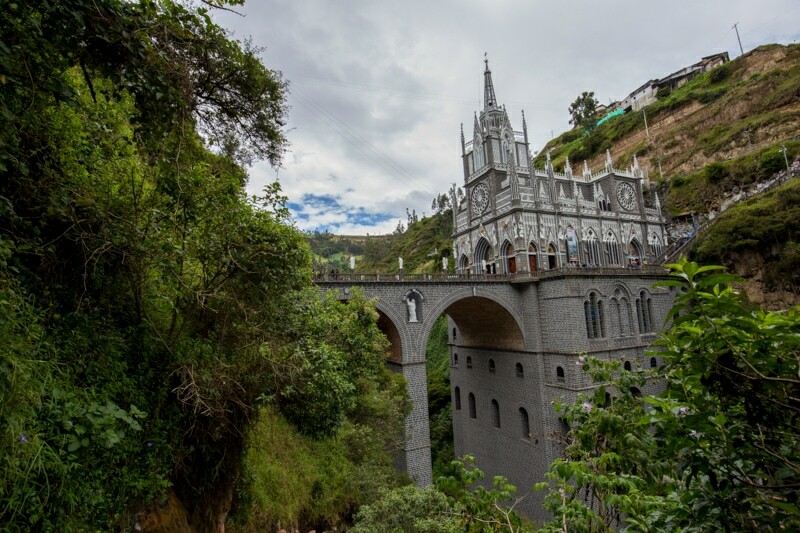 Thus, I made a visit to the Las Lajas Sanctuary, which must be one of the most beautiful churches in all of South America. This trip down South America has been led by the goal of photographing places I didn’t shoot on previous journeys. And well I did, in fact, photograph Las Lajas last time through, how could I not stop in for another couple shutter exposures again? This article is not about a certain photography skill, technique, or a product. This is just a beautiful church in one of my favourite countries in the world. Ipiales is basically 15 minutes from the Ecuador/Colombia border. 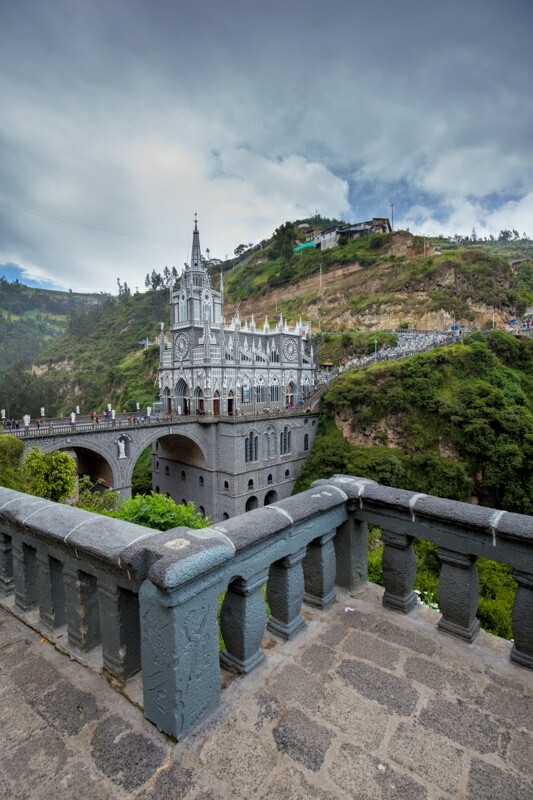 Then, the Las Lajas Sanctuary is another 15 minutes from Ipiales in the village of Las Lajas. You can hire a taxi to take you there, or there are collective taxis as well. From where the taxi drops you off, you need to hike down the hill about 5 minutes to reach the sanctuary. 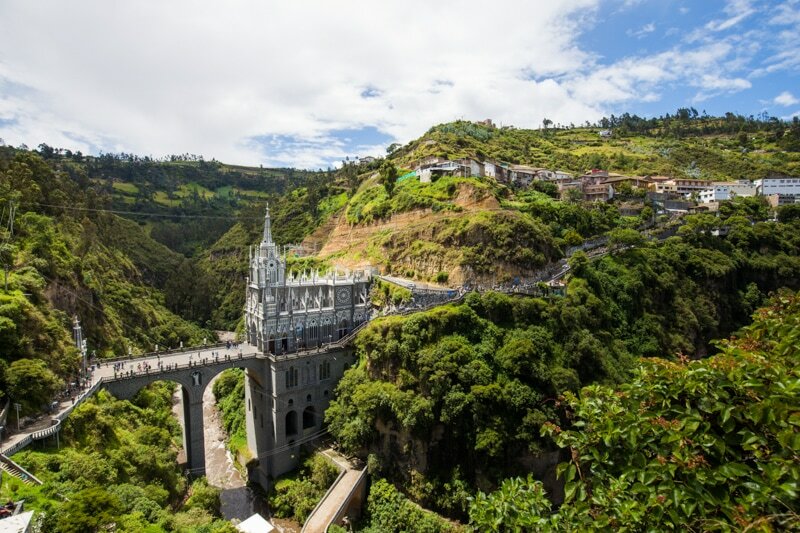 I have a full travel guide on Ipiales and Las Lajas that you can check out here. Absolutely. During the day, the park is filled with people enjoying the beauty of the area. There is no risk at all coming here. However, I asked at my hotel about the idea of staying to photograph Las Lajas Sanctuary in the blue hour and at night, and they warned me against it. Apparently, the church area really clears out at night and it’s not as safe a place to be. But to be honest, I really don’ think it would have been a problem. I think the hotel was being overly protective of me as a tourist. 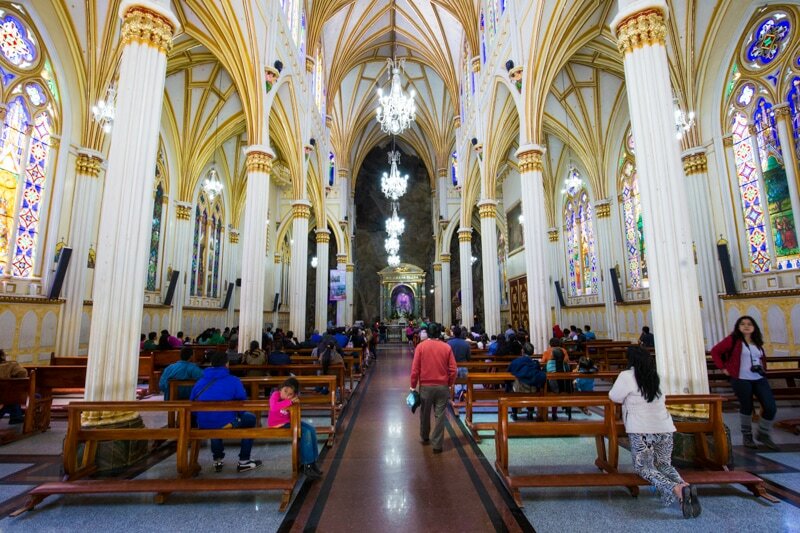 The building itself hasn’t changed, but Las Lajas Sanctuary has certainly become a bit more touristy. On the road down, there were llamas and alpacas dressed up and ready for people to take photos with – for a price, of course. There are also far more shops than before. I think I even saw a couple western tourists. Last time I visited the church I pretty much had it to myself. That wasn’t the case this time. The grounds were packed. Moreover, it looks like a lot of renovating has been done to the grounds. There is now a park for children and a path along the river that wasn’t there last time I visited. As I mentioned, I didn’t stay past sunset at Las Lajas so I didn’t grab any seriously special images. However, even during the daytime light, the church photographs pretty well. Here are a couple images. 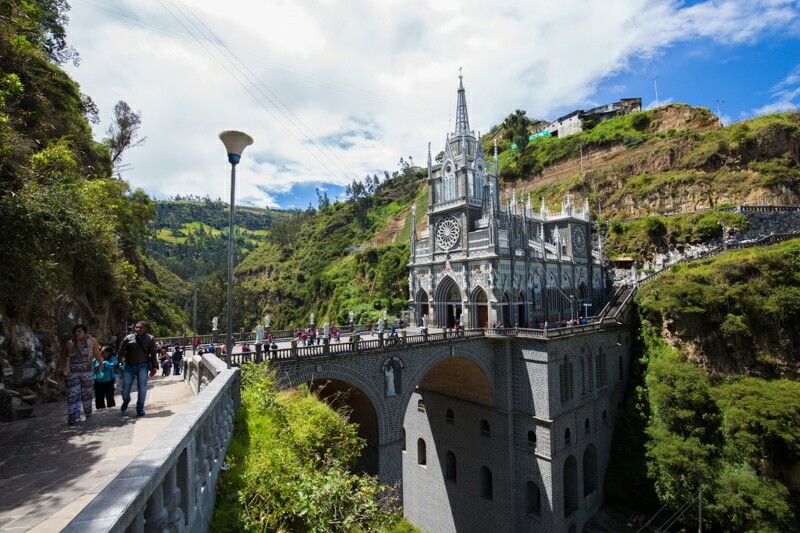 From Las Lajas Sanctuary, we are crossing the border to Ecuador. There we’ll be visiting the famous Otavalo market, Quito, and Baños de Agua Santa. There should be some cool photography coming up, so be sure to stay tuned. Previous ArticleIs Salento, Colombia South America’s Next Big Tourism Destination? this was an amazinly wonderful place to visit and thanks for sharing it. Modernization of a tourist spot is good, but one cannot deny that there will be a loss of serenity and quietness to a place once it becomes a famous tourist spot. And you’re right, the church photographs really well. One cannot deny why it has become a popular tourist destination throughout the years. Yes, isn’t Colombia fantastic, Rachel? When I was last in South America I was fairly new to photography, so I’m really excited to go back and properly shoot some of these amazing locations. Thanks for checking out the article! My wife and i planning to visit the basilica on march,where is the nearest airport located? Nearest airport will be in Pasto.